A mechanical arm with pod that lifts guests 300 feet above the water, skydiving, bumper cars, a circus school, and inside staterooms with virtual video balconies. These are just some of the cruise ship firsts that will be onboard Royal Caribbean’s newest vessel Quantum of the Seas. 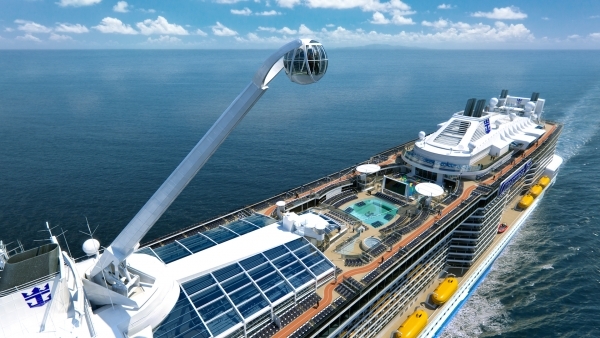 Launching in November 2014, the 4,180-passenger Quantum of the Seas will be based from Bayonne, New Jersey and will offer cruises to the Caribbean. This vessel is the line’s most ambitious ship to date. Royal Caribbean CEO Adam Goldstein said the design concepts for the new Quantum vessel started right after the launch in 2009 of Oasis of the Seas. On Quantum, firsts at sea include RipCord by iFly and North Star. North Star features a glass pod at the end of a mechanical arm that extends from the top deck. The 14-passenger North Star will offer guests 360-degree views from 300 feet above the ocean. On the Sports Deck aft will be the two-story vertical wind tunnel which will be home to RipCord by iFly. The skydiving is a safe, controlled, and simulated environment that allows passengers to hover in the air just like a real skydiver. The line says both experiences are complimentary to all passengers. With Quantum of the Seas, Royal Caribbean introduces the largest variety of stateroom categories, including new Studio staterooms, some with balconies for single travelers, three Junior Suite categories and larger Loft Suites. The 2,090 staterooms are slightly larger than the standard staterooms offered on the Oasis-class ships. Many interior staterooms will feature 80-inch video display monitors offering real-time views of the ocean and destinations allowing guests to feel like they have a real balcony albeit with no sea breeze. Additionally, the line is offering new staterooms for families with more interconnecting rooms. Royal Caribbean is making areas more multipurpose in order to transition for different activities from day to evening. At the aft of the ship is Two70°, a venue with floor-to-ceiling windows that tower three decks high and provide a 270-degree panoramic view. During the day, the room will be a lounge with casual dining, and the upper level will house a library, and scheduled activities including workshops, lectures and demonstrations. At night, Two70° becomes a hip energetic space featuring a combination of aerial artists, along with laser digital projections. The largest indoor active space at sea, SeaPlex is a flexible sporting and entertainment venue with exciting new features. It features a full-size basketball court and during select times a circus arts training center. At night, the floor can transform to accommodate bumper cars, roller skaters, and dance parties. Rooms surrounding the area feature table tennis, air hockey and foosball. Another multi-purpose area is the Music Hall a place for guests to enjoy intimate and exclusive access to live performances, DJs, theme night parties, billiards and more. Rebellious and edgy, Music Hall’s two-story design is inspired by the spirit of rock and roll. The ship will offer a number of the line’s standard highly-touted amenities on Quantum: the rock climbing wall, FlowRider surfing, the H2O Zone, the Solarium, DreamWorks Experience, spa, outdoor movies, and children’s play area. However, there are a few things missing from the ship that have been on the line’s newest ships for the past decade. The ice skating rink and the Royal Promenade will not be on Quantum. Goldstein noted that with all the new additions there simply wasn’t room to accommodate the ice rink. The Royal Promenade which has been a staple on the majority of the line’s newest ships will be altered as well. There will be similarities, but there will be many new features for guests to enjoy. Additional details about dining, entertainment and other unexpected features and amenities on Quantum of the Seas will be unveiled in the coming months. Its clear Quantum of the Seas is certainly a game changer in an industry that desperately needs some good news lately. Filled Under Blog, cruise ship orders, News, Twitter, What's New? Quantum of the Seas to have skydiving, bumper cars, and pod that lifts guests 300 feet above sea!